Data security is a major concern. There have not been any fundamental advances in encryption techniques for many years. A shortcoming of current techniques is that the encrypted data is not really secret, it is like a puzzle that is hard to solve, so as the computers become more powerful, there is always the danger that the legacy encryption techniques do not keep up. The only known absolutely secure system, dating back to the first world war, is based on a simple idea that a key is generated truly randomly, shared between two parties and used once and only once to encrypt a text. Following the name of its inventor, this method is known as the known as the Vernam cipher (also known as the one-time pad). Information theoretic results indicate the existence of data transmission strategies with unconditional security (unbreakable security). Motivated by this promise, in recent years, a large number of excellent research works have been devoted to further study these fundamental theoretical findings. However, translation of such theoretical results to practice remains a challenge. In particular, approaching Shannon limit for certain random codes lies at the hearth of information theoretical security results. These random codes should have two features: (1) error free detection for the legitimate receiver, (2) total randomness in erroneous detection (zero information, or a bit error rate of 50%) for the Eavesdropper. In recent years, there have been codes with iterative decoding that come quite close to the Shannon limit in terms of providing error free detection, but these codes (constructed from linear structures) do not satisfy the second requirement of total randomness in erroneous detection. Indeed, forward error correction codes provide a low bit error rate if the frame is in error, which is the opposite of the second requirement (requiring a bit error rate of 50% if the frame is in error). Another area with promise for unconditional security is Quantum Cryptography, which in spite of many excellent theoretical developments, is also still far from practice. In addition, the fundamental problem mentioned above in translating information theoretical security to practice also applies to methods based on Quantum Cryptography. Overall, the only applicable method of security is currently based on computational complexity which means encrypted data is not really secret, it is just difficult to guess. With the ever increasing computing power and sophistication of hackers, these conventional approaches will be soon obsolete. This research introduces a novel practical approach to provide unconditional security based on using a wireless channel to establish a secret key (one-time pad) between two legitimate parties. 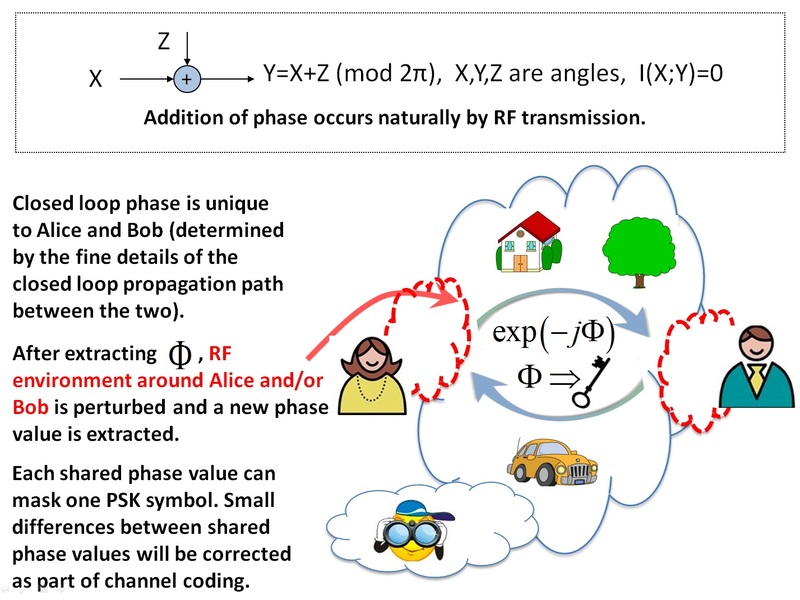 Wireless channel enables providing a reference of phase between the two legitimate parties which in turn is used to extract a common phase value. Each such phase value can completely mask a phase-shift-keying (PSK) symbol (zero information leakage). The shared phase depends on the propagation environment between legitimate parties and will be impossible to guess even by an eavesdropper who is in close vicinity, has unlimited processing power and enjoys high signal-to-noise ratio. Wireless link in essence provides a wireless entanglement between legitimate parties. Thereby, this method is called Wireless Entanglement Security (WES). Unlike methods based on Information Theoretic Security or Quantum Cryptography, the proposed WES approach can correct for possible mismatches between common phase values as part of the underlying error correction scheme used for data transmission. In addition, this research introduces methods to perturb the wireless channel such that a number of such common phase values can be generated, together providing a longer secure key.